They didn’t have another rally in them. 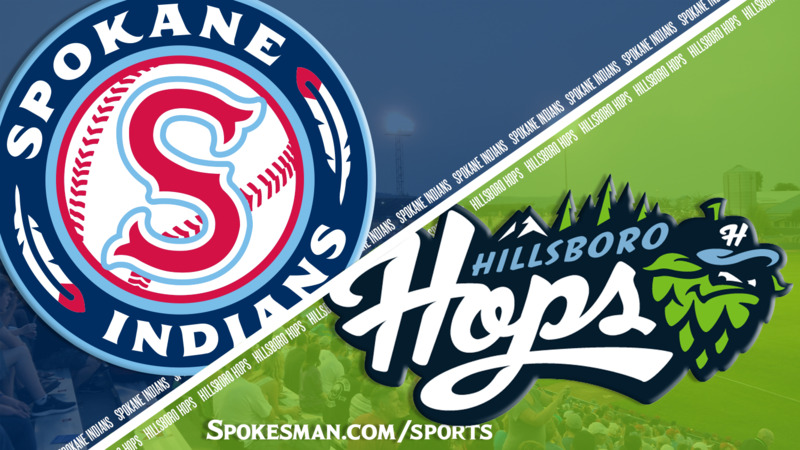 The Spokane Indians survived a terrible defensive inning to tie the game in the middle innings, but when the Hillsboro Hops rallied for two runs in the ninth inning, the Indians couldn’t answer the call. William Gorman went 4 for 4 with two runs and two RBIs and the Hops beat the Indians 8-6 in the fourth of a five-game Northwest League series at Avista Stadium on Monday. The Indians (4-3) remain tied with Vancouver at the top of the North Division. J.P. Martinez went 3 for 4 with a pair of doubles and Curtis Terry went 2 for 3 with his league-leading 12th home run – tying his mark which led the NWL last season. Diosbel Arias went 3 for 5 with two RBIs. All three committed errors though. In the Hops’ six-run fifth inning, the Indians allowed five hits, a walk and three errors. They committed four total – and a dropped popup became a fielder’s choice. “Nothing to be proud of on the defensive side,” manager Kenny Holmberg admitted. He praised his team’s resiliency. Gorman led off the ninth with a single against reliever Xavier Moore. He stole second and went to third on a single to left by Keshawn Lynch. Arias caught the cutoff throw and threw behind the runner at first. His throw was in the dirt and got away from Hasuan Viera, allowing Gorman to walk home with the go-ahead run. Moore hit Zack Jones, then the Hops pulled off a double steal. L.T. Tolbert lined one off Cristian Inoa’s glove and into right field to drive in another run. The Indians went quietly in the bottom half. With two down in the first, Curtis Terry lofted a long fly ball to left center that caromed off the top of the wall and back toward the playing field. He lumbered to third for his third career triple and first with the Indians. Arias cashed the run in with a line-drive single to right center. He raised his average to .362, second in the league. The Indians built onto the lead in the fourth – all with two down. Francisco Ventura and Troy Dixon collected back-to-back singles and Cristian Inoa walked to load the bases. Viera – who struck out looking on a borderline call in his first at-bat – ripped a single into right center to plate two runs and put the Indians up 3-0. The Hops got to Indians starter Tai Tiedemann in the fifth. With one out, Jake McCarthy ripped a hard one-hopper to Terry at first that took a bad bounce and ended up in the right-field corner for a triple. McCarthy scored on Jorge Perez’ line-drive single right. Tiedemann then issued a four-pitch walk to Andy Yerzy and a bloop single by Joey Rose loaded the bases to end Tiedemann’s night. Wes Robertson entered and struck out Francis Martinez but Will Gorman’s grounder to the right side got through and plated two runs to tie it up and put runners at the corners. The Hops ran a delayed double steal and the Indians bit. Ventura threw down and Gorman got into a rundown while Rose trotted home without a throw. Gorman ended up safe at first when Terry dropped the ball at the bag. Lynch reached on an error by Arias, and two runs scored on Zack Jones’ single and throwing error by center fielder J.P. Martinez. Tiedemann was charged with four earned runs on five hits with five walks and four strikeouts over 4 1/3 innings. Martinez drew a walk to lead off the bottom half and came around on Terry’s homer to get the indians within one. The Indians got two on with one down in the sixth, but Jonah McReynolds grounded into a rally-killing 5-4-3 double play. They made good in the seventh. Martinez led off the seventh with a double, Terry walked and Arias followed with an RBI single to tie it at 6. Jax Biggers bounced to first to move the runners up, but Ventura struck out and after Dixon drew a walk to load the bases, Inoa grounded to short to end the rally. Martinez ripped a double with two down in the eighth and the Hops intentionally walked Terry. Arias followed with an infield single to load the bases, but Biggers grounded to first to end the inning. Published: July 30, 2018, 10:31 p.m. Updated: July 30, 2018, 11:01 p.m.